This year I wanted to do something a little different for Christmas gifts. Instead of just getting people electronics or video games or clothes, I wanted to give something that encouraged creativity and making. A lot of people never even think to try to make things on their own, so maybe a little hobby-style gift will give them a taste and spark an interest. To that end, I did two things. First, I bought ten MSP430 LaunchPads. These things are really inexpensive, so they make great stocking-stuffers. If you don’t know what the MSP430 is already (really, we talk about it constantly, where have you been), it’s a 16-bit microcontroller with really low-power consumption needs. They run on 1.8 to 3.6v power supplies at up to 16MHz, making them quite a powerful little beast for only $4.30, which includes the chip programmer. If you were to buy the chips alone, they cost about $0.50 each, with a few different serial communication protocols built in, and requiring only a small selection of external parts (2 resistors and 2 caps if you want to do it right, 1 resistor if you’re living dangerously, and face it, at $0.50, you can afford to live dangerously). It’s something of a long-term project plan of mine to buy 100 of these and try to build a small, physical neural network computer. A lot of people have shied away from the MSP430 because the Code Composer Studio software–based on the professional-grade Eclipse development environment–is very difficult to use in comparison to the Processing-based software typically used to program Arduinos. But luckily, someone has taken the Arduino cue and created Energia, a Processing-based editor for use with TI’s LaunchPad line of MCUs! If you’re experienced with Arduino, using Energia is a snap, and if you’re not experienced at all, it’s really not that big of a learning curve. Second, I bought supplies to make “magnetic Silly Putty”. About a week ago, I saw this Instructable about kneading some Iron-Oxide powder into a little Silly Putty and jumped on Amazon right away to get a 6-pack of Silly Putty eggs and a 5 lbs bag of black Iron-Oxide pigment. Honstely, 5-lbs is way too much, but there are plenty of other things you can do with it, like make ferrofluids or your own paint, so it’s handy to have around. You will need a fairly strong neodymium magnet, but again, these things are fun enough to have around anyway, so have at it! Making the putty is really easy. I pooled all 6 eggs of putty together in a non-stick pan. On very low heat, I warmed up the putty until it was just too hot to handle with my bare hands. If it starts to become the consistency of chewing gum and sticks to the pan, don’t worry, it will unstick when it cools down. Don’t heat it further than that though, it will start to smoke and burn. Wearing rubber gloves to give me just enough insulation from the heat and to keep my hands from getting stained black, it’s just a matter of working a large, heaping tablespoon-full of the black powder into the putty. You will need to work the putty like taffy, stretching it and folding it to blend the powder evenly into it. Once the powder is sufficiently kneaded in to the putty, it will not stain anything, so keep testing it on the back of your rubber glove to see if it leaves any marks. 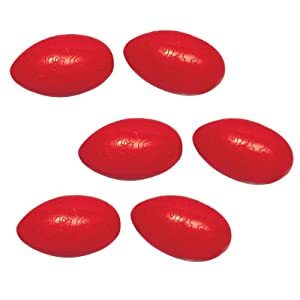 I then cut the putty into 6 equal chunks and shoved them back in their eggs. It took 10 minutes total. I thought about taking some photos of the process to show it off, but really, it could not be simpler. I’m hoping these gifts will be completely unexpected and will inspire people to try something they never would have considered on their own. The MSP430s are just a really easy, cheap, fun way to get into programming, and the magnetic Silly Putty is a great example of something you can’t buy as a product that is also extremely easy to make. The idea for magnetic silly putty is awesome. I’ve bought neodymuim magnets as gifts before, and they are always a hit, even with folks that really aren’t into the maker movement. I think of it as a way getting people interested in the maker movement without them even knowing it! I think I’ll start adding some magnetic silly putty to my gift list.